Shortly before midnight on June 1 in Tromsø, Norway, the partially eclipsed sun will hang just above the northern horizon. Wednesday brings a partial solar eclipse to parts of Asia and North America, but it comes with an odd twist: At one point, the eclipse will be occurring at "midnight" between the two days this week. During the eclipse, the outer shadow of the moon (called the penumbra) will first fall on northeast Asia as the eclipse begins, and then work its way east across the International Date Line. Because of that timing, this eclipse will have the quirky circumstance of beginning on the morning of Thursday (June 2) and ending on the evening of Wednesday (June 1). For this partial solar eclipse, the axis of the moon's shadow, the dark cone we call the umbra, actually never hits the Earth’s surface, passing about 843 miles (1,358 kilometers) above Cheshskaya Bay and the Bolshezemelskaya Tundra of far northwestern Russia. There, the sun will be seen to dip right to the northern horizon — at the "midnight" point of its 24-hour Arctic day — before climbing again. During the few minutes in which the eclipse will reach its peak, with the top three-fifths of the sun bitten away by the moon, the sun will take on the appearance of a huge boat sailing out over the icy Barents Sea. Greenland and Iceland are also within the eclipse zone, the latter getting a view just before the sun begins to set in their late evening. While total solar eclipses, which can be viewed only from the narrow path of the moon's shadow on the Earth, partial solar eclipses can be seen across much wider geographical areas. A NASA skywatching table available here details the local eclipse viewing times for different locations around the world. WARNING: NEVER stare directly at the sun with your naked eye or through binoculars or a telescope without proper light filters. Serious eye damage can result. ok This NASA graphic shows the track of the June 1-2 partial solar eclipse, which will begin on June 2 and end on June 1 due to a fluke of its path across the International Date Line. For the North Americans, we might call this the "Alcan Eclipse" since it will be visible primarily from Alaska and northern Canada. 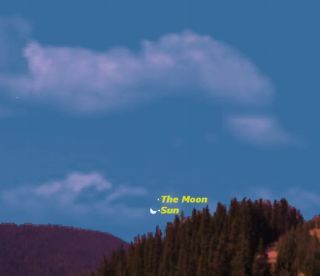 Skywatchers in Alaska who will see a very small, but noticeable, scallop taken out of the upper limb of the sun around 1 p.m. Alaska Daylight Time include those in Fairbanks, Nome and Barrow. In Canada, careful viewers in the Maritime Provinces might be able to detect a tiny "dent" in the sun’s upper right rim. Charlottetown, P.E.I., Moncton, New Brunswick, Glace Bay, Nova Scotia and St. John’s, Newfoundland, are all just within the visibility zone of this upcoming eclipse. One might wonder if any part of the contiguous (48) states will be able to see this eclipse and the answer is "yes," but just barely. To call this an "eclipse" for Maine skywatchers is being charitable, to say the least! This NASA table lists the best viewing times for the partial solar eclipse on June 1-2, 2011, including major cities and the amount of eclipse skywatchers can expect to see by location. Once again it needs repeating: looking at the sun without proper eye protection is dangerous. Looking at the sun is harmful to your eyes at anytime, partial eclipse or no. Many people are under the mistaken impression that when a solar eclipse is in progress there is something especially insidious about the sun's light. But the true danger that an eclipse poses is simply that it may induce people to stare at the sun, something they wouldn't normally do. The result can be "eclipse blindness," a serious eye injury that has been recognized at least since the early 1900s. About half of the reported victims of eclipse blindness recover their precious quality of eyesight after a few days or weeks. The other half carries a permanent blurry or blind spot at the center of their vision for the rest of their lives. By far, the safest way to view a solar eclipse is to construct a pinhole camera. A pinhole or small opening is used to form an image of the sun on a screen placed about three feet behind the opening. Binoculars or a small telescope mounted on a tripod can also be used to project a magnified image of the sun onto a white card. Just be sure not to look through the binoculars or telescope when they are pointed toward the sun! A variation on the pinhole theme is the pinhole mirror. Cover a pocket-mirror with a piece of paper that has a one-quarter-inch hole punched in it. Open a sun-facing window and place the covered mirror on the sunlit sill so it reflects a disk of light onto the far wall inside. The disk of light is an image of the sun's face. The farther away from the wall the better; the image will be only one inch across for every 9 feet from the mirror. Modeling clay works well to hold the mirror in place. Experiment with different-size holes in the paper. Again, a large hole makes the image bright, but fuzzy, and a small one makes it dim but sharp. Darken the room as much as possible. Be sure to try this out beforehand to make sure the mirror's optical quality is good enough to project a clean, round image. Of course, don’t let anyone look at the sun in the mirror. Unacceptable filters include sunglasses, color film negatives, black-and-white film that contains no silver, photographic neutral-density filters and polarizing filters. Although these materials have very low visible-light transmittance levels, they transmit an unacceptably high level of near-infrared radiation that can cause a thermal retinal burn. The fact that the sun appears dim, or that you feel no discomfort when looking at the sun through the filter, is no guarantee that your eyes are safe.